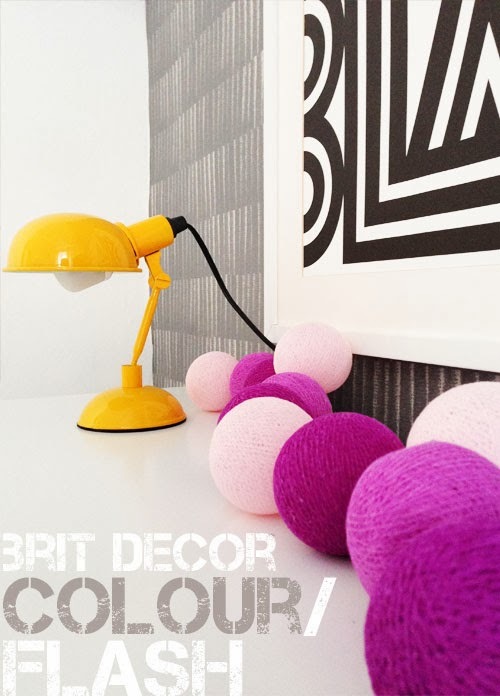 My weekend was was filled with sunshine and colour, quite literally! Everything was bathed in golden light and the mood was that of Springtime. We had two of our friends come over to the cottage for dinner on Saturday evening, and after a major panic over dessert and a last minute change from what should have been a luxury Italian trifle, I managed to pull everything together after whipping up one of my moist chocolate cakes! Our friends arrived bearing a stunning bouquet of Iris, which I couldn't wait to share with you (above). 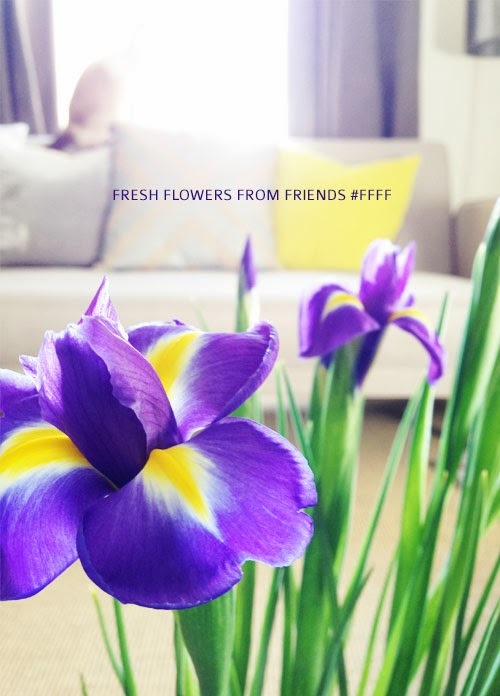 These sumptuous purple flowers with their golden centres really brought the sunshine indoors and instantly freshened the lounge. Meanwhile, my study revelled from a party-feel with an amazing gift from Moonberry with a set of their vibrant and fun garland lights, which in reality have already been earmarked by my sister for her incredible daughter (proud uncle talk). 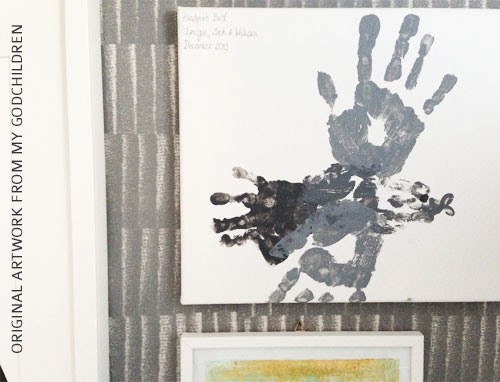 Speaking of amazing little people, my heart is always warmed by the handprint canvas on my office wall, created by all three of my awesome godchildren - and how did they know I love grey so much!? Original artwork is so very priceless, right? 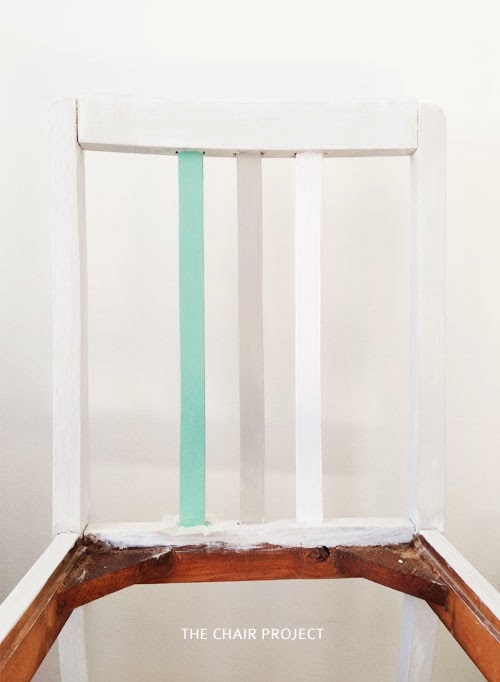 I always find that my creativity levels shoot skywards when the sun is shining and so I decided it was the perfect time to begin renovating two vintage dining chairs, which my Gran kindly gave to me when I moved into my first ever home. They have travelled with me on a sentimental journey ever since but I have long felt that I needed to give these chairs a little more of the limelight. With a coat of chalk paint some subtle strips of colour via Farrow & Ball's; All White, Hardwick White and Arsenic, the difference was immediate and so much fun to work on. The next step will be to add some linen upholstery to the seat pads to complete the transformation and allow the chairs to take pride of place at the kitchen table. I hope that your weekends were filled with inspiration and chocolate puddings too! It sure does Karen and I'm missing it already! I love tulips too, I had some powder pink ones in the lounge the previous week. Hope you have a great week ahead.